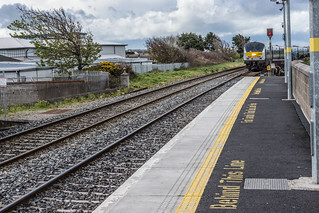 Balbriggan is 32 km north of Dublin city, on the Belfast–Dublin main line of the Irish rail network. Commuter rail services serve Balbriggan railway station, which opened on 25 May 1844 and closed for goods traffic on 2 December 1974. It is estimated that about 2,200 commuters use the station every working day. The town is also located next to the M1 motorway (the section known as the Balbriggan Bypass), which was completed in 1998. Prior to this, the main Dublin-Belfast road went through the centre of the town, with major traffic congestion on a daily basis.